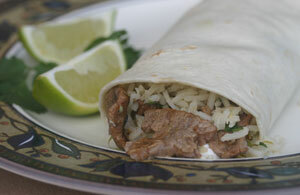 A typical carne asada burrito is filled with grilled steak. You can use either a cheaper cut like skirt or flank steak, or a more expensive cut like top sirloin, tri tip or even more expensive cuts if you wish. The difference between the cheap cuts and the more expensive is that you will have to marinate the flank or skirt steak longer in order to tenderize them. I used tri tip for my carne asada burrito and only marinated it for 1 1/2 hours which worked quite well. I also used a combination of orange and lime juice for a nice even citrus flavor. I find that if I marinate over night lets say, the lime flavor is too over powering for my taste buds. I like to serve my carne asada burrito filled with cilantro lime rice, refried beans, salsa, cheese, sour cream and guacamole. Don’t forget the tortillas. You can use either flour or corn, although flour makes better burritos. Heat them on the grill or in a frying pan, one at a time or you can use a tortilla “oven” and heat several at a time in the microwave. They stay hot for 45 minutes. If you are looking for a spicy hot marinade, try adding some sliced jalapeno or chipotle chiles in adobo sauce to the marinade. My family doesn’t like it too spicy so I left that out of this recipe. If you are using flank or skirt steak, plan to marinate over night or at least 6 to 8 hours. The rest of these directions are geared for using tri tip or another more expensive cut of beef. Slice the beef thin across the grain and place in a glass dish. Add the marinade ingredients above, stir until well distributed, cover and refrigerate for 1 to 2 hours, (1 hour is perfectly fine). Prepare the cilantro lime rice and keep warm. Make fresh guacamole (it is so worth making homemade). Fire up the grill. It’s important to have a hot grill when cooking the carne asada. Once it’s hot, brush the grill with olive oil. This will help keep the meat from sticking. Remember to discard the marinade. When it’s time to pull the carne asada off the grill, place it in a new dish that has been warmed. I sometimes will place my dish in the bbq on the side (if you have room). Other wise I will heat it in my oven or microwave just before I pull the meat off. This is a nice touch and will help keep the carne asada warm. You may want to chop up the beef into yet smaller pieces for easier eating. If you have a tortilla oven, get those tortillas nice and hot. Now you are ready to assemble your carne asada burrito. First take a hot flour tortilla and place some hot refried beans along the center of the burrito. Add a spoonful of rice on top, then add the carne asada. Now add a sprinkle of cheese (so it will melt touching the hot meat), salsa, sour cream and some luscious guacamole. Fold up the end and roll it over. Now you are in for a delicious feast. My mouth is watering just thinking about it.